Textures are an easy way to enhance your photography. A simple addition of an interesting layer can add depth and dimension, creating a beautiful photographic composite. I keep a folder of textures that I photograph from everywhere I go. One of my favorites is a peeling and cracked wall that I shot in Charleston, South Carolina. The paint was gold, what was left of it, and it blends beautifully with many of my images. 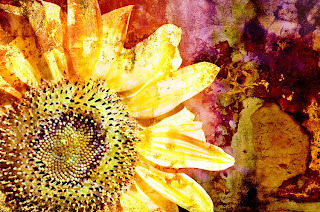 Here, I used it with a photo of a sunflower that I shot in infrared. Infrared imagery is often the perfect pairing for textures as they work well together. I discuss this in my online course Digital Infrared Photography at BetterPhoto.com. Textures can encompass anything your heart desires, sections of old rusty doors, the side of a weathered barn, old bricks, or layers of aged and peeling paint such as those found in wonderfully photogenic historic areas. Do what I do, keep a folder handy, and keep adding to your collection as you as you come across interesting textures. Experiment and have fun!